Now that you're in the 15th week of pregnancy, you're feeling better physically. 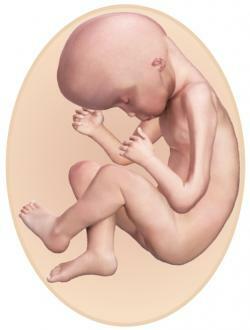 Your little one is getting bigger all the time, gaining length and weight on a daily basis. You're gaining weight too, an average of a pound a week. Your baby's bones are starting to ossify. They are now hard enough that you would be able to see your baby's skeleton in an x-ray. However, your baby's skin is still very transparent and thin. Your little one is continuing to grow hair on his or her eyebrows and head. If he or she will be born with dark hair, the hair follicles are beginning to manufacture the necessary pigment. Your baby's heart is pumping approximately 25 quarts of blood per day. By the time he or she is born, the heart will pump over 300 quarts per day. If abdominal pain is severe or if you notice bleeding, be sure to contact your doctor or midwife immediately. Now that you're well into the second trimester, it's time to start gaining weight more quickly. Because your baby is growing so rapidly right now, you can expect to gain an average of a pound a week. Some weeks this may be slightly more or less, depending on whether you baby is having a growth spurt, but this type of weight gain is perfectly normal. Your healthcare provider will weigh you at every prenatal visit, and you can also weigh yourself at home. 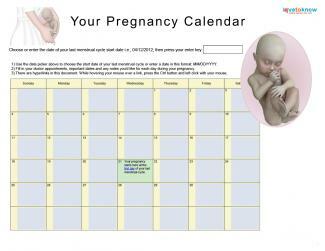 By pregnancy calendar week 15, your uterus is between three and four inches under your navel. At your prenatal appointments, your doctor will now begin measuring your fundus, or the distance between the top of your pubic bone and the top of your uterus. Fundal height measurements are used to chart your baby's growth and determine his/her position. Starting in the 15th week, your doctor or midwife may begin offering you some important prenatal tests. The American Pregnancy Association lists the following as some of the tests offered during this point in your pregnancy. Typically performed between 14 and 20 weeks, amniocentesis involves inserting a needle into the mother's abdomen and withdrawing some of the amniotic fluid for testing. It carries a risk of miscarriage, estimated between 1 in 400 and 1 in 200. This test can tell doctors whether your baby is at risk for Down's Syndrome or another chromosomal abnormality, and it can also establish paternity. Amniocentesis is usually offered to women who are over age 35 or who are at risk for chromosomal birth defects. Alpha-fetoprotein (AFP) - This is a blood screening that checks for neural tube defects such as spina bifida, anencephaly, and Down syndrome. However, a positive result doesn't automatically mean there is a problem. The AFP test has a high false positive rate, so your doctor will most likely order additional tests to confirm the diagnosis. Human chorionic gonadotropin (hCG) - This test measures your level of the pregnancy hormone hCG, the same hormone that gave you a positive result on your home pregnancy test. Abnormal levels of hCG can be an indication that your baby has some type of chromosomal abnormality. Estriol - This part of the quad screen tests the level of estriol, which is a hormone produced by the placenta and the baby during your pregnancy. Abnormal levels can point to a chromosomal abnormality. Inhibin-A - This protein, which your ovaries and placenta produce throughout the pregnancy, is also measured in the blood test. If you have high levels of inhibin-A, your baby may have a greater risk of Down's Syndrome or another chromosomal disorder. The second trimester is a time of significant growth for your baby, and it's generally a great time for you, too. Since you're feeling more energetic, it can be a great time to take on a new hobby or work on a project for your baby's nursery. You'll be meeting your little one in only a few short months.